Good morning, everyone! It’s harvest time in all parts of the country (the United States, that is), and part of the harvest this time of the year is dried beans. (Or, like me, you let your shell beans stay on the vine too long and they become dried beans. 😉 ) Whether you intentionally dry your beans on the vine or you have too many dried pods for use as seed for next year, you’ll need to know how to prepare them for long-term storage. 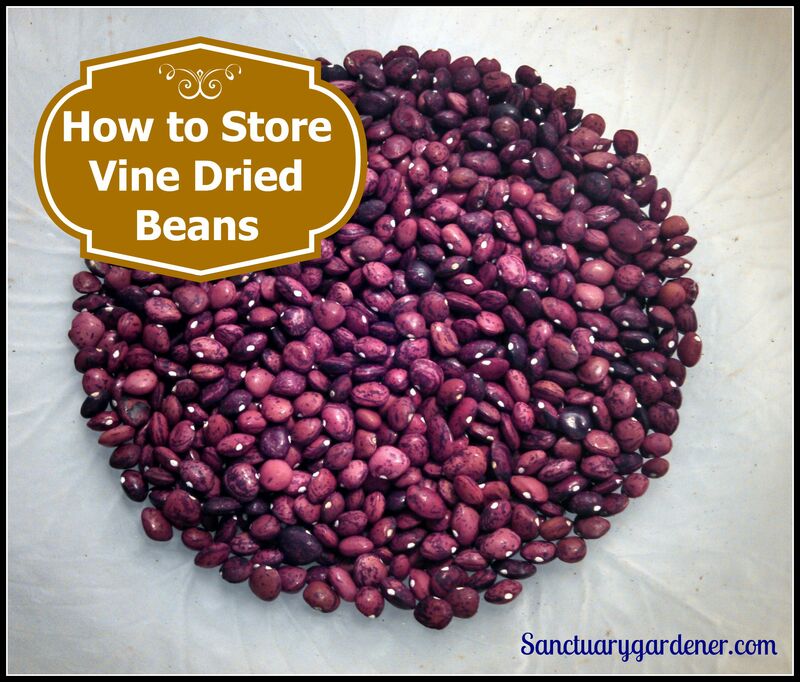 How to store vine dried beans! For the first time in three years, I have successfully grown pie pumpkins. It was a matter of finding the right variety of pumpkin to grow in our subtropical heat. Seminole pumpkin is THE variety for Charleston. And is it prolific! I planted two vines, and I’ve harvested seven pumpkins already – with about 16 more on the vine. This past week, I processed those pumpkins into a form fit for the upcoming holiday season’s pies and desserts – pumpkin puree. How to make pumpkin puree! Last fall, I planted an entire raised bed of Italian softneck garlic. Quite a few of my bulbs were left in the ground too long, so they were starting to split. Knowing they wouldn’t keep for months like the good bulbs (which are braided and hanging in my kitchen), I decided to pickle them. After letting them fully cure for about six weeks, I decided they were ready to pickle this weekend. 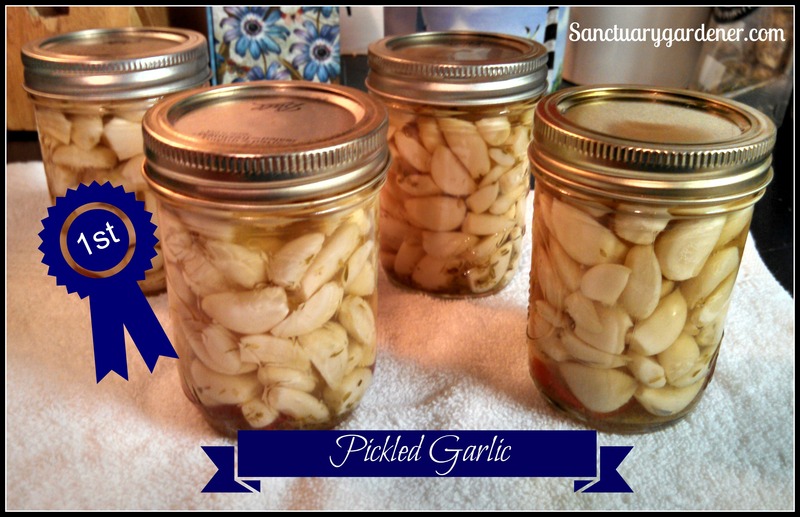 Pickled Garlic! A couple days ago, I came home from work and immediately started prepping to can some diced tomatoes. I had a counter full of tomatoes – especially cherry and pear tomatoes – so I figured diced tomatoes was the way to go. I postponed eating so I could get right to peeling and dicing and jarring up my tomatoes. But despite the hours of work, something went wrong. Tomato canning failure! This was the first year my Celeste fig tree produced fruit, and I am quite happy with the harvest – about 13 dozen over the past couple months! Because figs have a “shelf life” of only a couple days, I peeled and chopped them as soon as I harvested them and put them in the freezer (in freezer bags) until I had enough to make fig preserves. Last week, I made three batches of preserves with this recipe – just in time to enter a jar in the competition at the county fair (where I won first place AND Best of Show third place)! Fig Preserves! Jelly, Jam, and Preserves: What’s the Difference? Yesterday, I posted about the fair coming to town this month, and asked you to comment on what I should enter in the home canning competition. (If you haven’t commented yet, click here and leave your advice for me!) 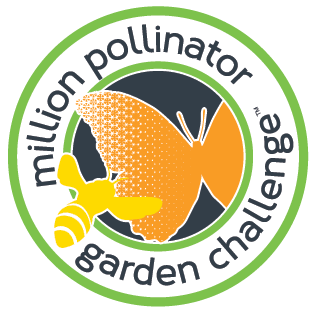 Well, the competition rules are very specific regarding the categories entered – so specific, I had to know whether my entry was a jelly, jam, preserve, chutney, marmalade, fruit butter, etc. I knew jellies and jams were different in texture and consistency, but what’s the difference between jams and preserves? After researching this, I found there are very specific differences, and the recipe ingredients and procedures are a good indication of what it is. 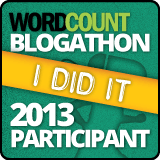 Now I want to share with you what I learned. (Photo credit: www.commons.wikimedia.org) Learn the difference! I think it’s safe to say that my peppers – both sweet and hot – are the most productive crop I have. That said, what can you do with pounds and pounds of peppers? I’ve stuffed them (with ground beef and chicken), frozen them, dehydrated them, pickled them, and made hot pepper relish. So, why not make hot pepper jam? This recipe isn’t as firm as the hot pepper jelly you buy in the store, but I like the jam consistency (thicker than a preserve but not stiff like a jelly). Also, I don’t add food coloring to what I eat, so what you see is the natural color. 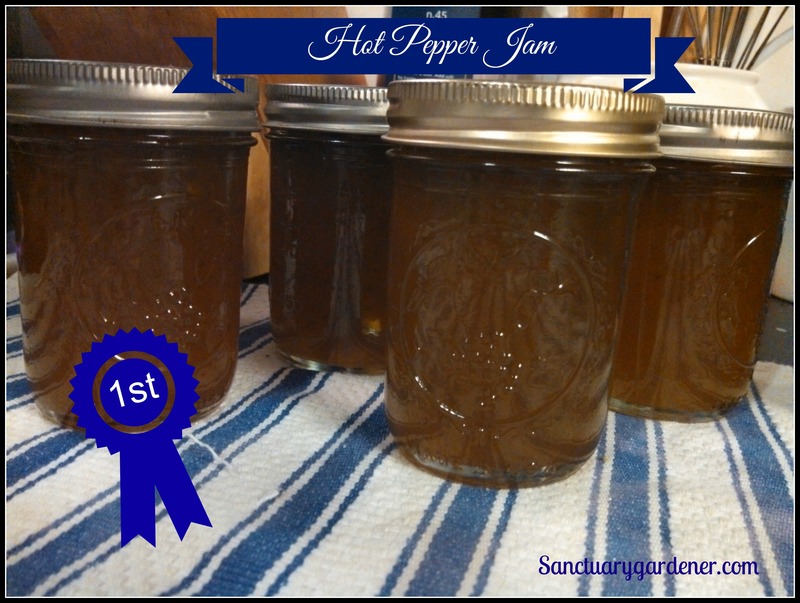 Hot Pepper Jam! I didn’t plan to make apple chips this weekend, but I was given six pounds of Pink Lady apples for free. Some of them were a little bruised, so I knew I had to use them quickly. The dehydrator was still on the counter from making banana chips, so I figured I’d make apple chips. I absolutely LOVE apple chips! In fact, I’m eating them as I write this – and I have to be careful not to eat the whole jar in one sitting. Unfortunately, apples don’t grow here in the Low Country, so I have to get mine from the store or the farmer’s market. If you’re fortunate enough to be able to go apple picking (it’s that time now), consider making apple chips with some of your bounty. Apple Chips Recipe! I like to eat trail mix, even when I’m not hiking. And one of my favorite ingredients in trail mix is banana chips. I haven’t been hiking or camping in a while, so I’ve been getting a hankering for banana chips. Although I don’t grow my own bananas (we’re sub-tropical here, not tropical), what’s stopping me from putting up food I can’t grow myself? Absolutely nothing. So, I decided to purchase two bunches of bananas (six pounds) and pull out my dehyrator. Banana Chips recipe! The one crop I have that has been producing abundantly (even with the heat-induced slow-down) is my peppers. Both my sweet and hot peppers have been my most productive crop! But what to do with all those peppers? I’ve frozen some, dehydrated more, pickled a few jars, and eaten them fresh. But they keep coming! So, I decided to make some hot pepper relish. Yummy! 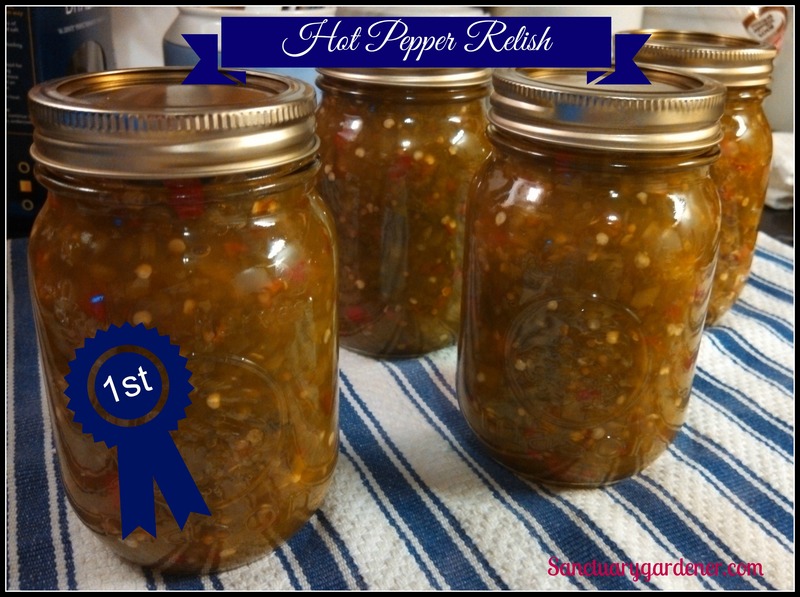 Hot Pepper Relish!